Welcome To Your Simple And Effective Guide To Introducing A Puppy To An Older Dog. So puppy fever has struck again, has it? It’s pretty common for dog owners to get the itch for more puppy breath and the pitter patter of little feet after a few years. 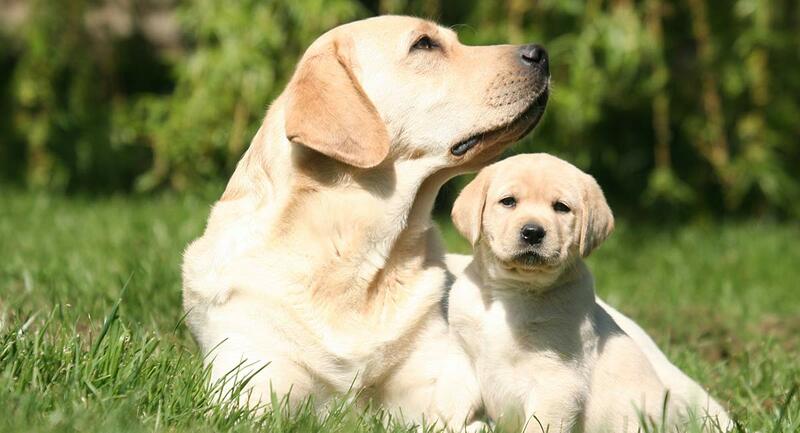 But a lot of owners get a little nervous at the idea of introducing a puppy to an older dog. There’s no magic trick to knowing the right time to introduce a new dog to one you’ve already had for a while, but there are some tricks for making the transition as smooth as possible. We thought we’d put together some tips on how to introduce a puppy to an older dog from behavior experts, trainers, and folks who have been in your shoes. 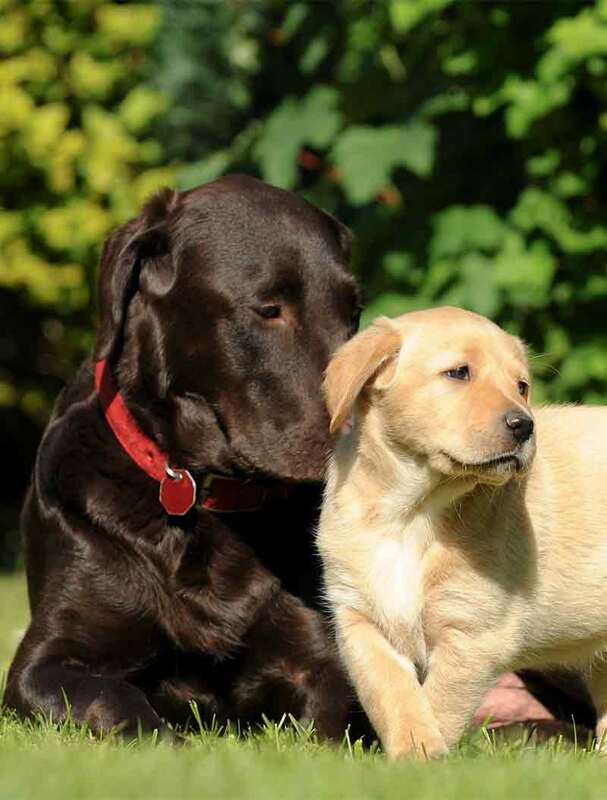 By thinking a few steps ahead of situations in which problems are most likely to arise, you can prevent a lot of the common difficulties of introducing a puppy to an older dog. 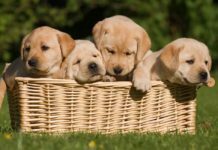 The biggest hurdle will be the difference between the high energy of a new puppy with older dog characteristics like lower energy, preference for his old routine, and any past injuries or pain that make playtime between these dogs very different. You’ll need to become a bit of an expert at reading your older dog’s body language. When your older dog shows the signs for, “I’m tired” or, “Leave me alone!” you’re better off intervening to nip any potential fights in the bud. 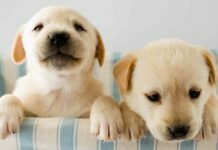 If you’re scheduling your new puppy pick-up in advance, and you already know which puppy you’re getting, you can ask the breeder, owner, or shelter manager for a piece of cloth that has been rubbed on the pup. Let your current dog smell it back at home to start making a mental map of the new family member coming his way. Training expert Patricia McConnell recommends introducing dogs to one another in a completely neutral area, like a park or a friend’s house. Make sure the space is fenced-in so that you can let both leashes drag loosely on the ground. “Dogs can feel any slight amount of tension in their leash, and it gives them an overall feeling of tension in their body, too,” she says. If any problems come up, you can easily grab the end of the leash and separate the dogs safely. It’s important the first time to have a second person around to help separate the dogs. And keep an eye on that body language! Stay relaxed and playful, while always gauging the situation. Patricia recalls a particularly difficult introduction of a high energy new dog to an elderly dog of her own. A ‘howdy crate’ is a term zookeepers use when introducing a new animal into an exhibit with other animals for the first time. By putting the new animal in a crate in the exhibit, the animals can all say, “Howdy!” to one another through the safety of the crate walls. 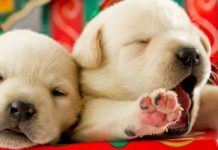 Use the same concept at home by putting your new puppy in a crate in the front yard or living room so that your older dog can spend some time getting to know the new pup’s scent and sounds. A great way to keep things moving is by going for a walk together. Some behaviorists observed that simply going for a guided walk can reduce tension, anxiety, and fear in dogs. It also helps establish familiarity with other dogs in a natural canine social behavior. Both dogs are distracted from the introductions by physical activity and the sights, sounds, and scents of the world around them. To do an effective parallel walk, two walkers each have one leashed dog. Throughout the walk, the walkers rotate through positions – the older dog could start in the lead, about 10 yards ahead of the puppy. Then after 10 minutes, the positions are reversed. After another 10 minutes, the dogs are brought side by side with only a yard or two of space between the now parallel-walking dogs. And don’t forget to stay relaxed, avoid tension in the leash, and be ready to “keep things moving” with Patricia’s cheerful chatter method. You can apply the same intent behind parallel walks to keep the dogs active and distracted from antagonizing each other by playing training games with both dogs near each other during early introductions. Instead of simply turning both dogs loose in the backyard and watching what happens, you can run them through a series of simple cues and tricks. For example, grab your treat pouch and your clicker (if you use one) and stand in the middle of the backyard, occasionally calling out a cue that your older dog knows. Sit, high five, turn in a circle, target your hand or a target pole, etc. Run through a few commands that will earn your dog some treats and distract him from the new dog. Have a second handler working with the puppy, introducing some basic training games for puppies. Both dogs will be preoccupied, with intermittent sniff and greets in between mini sessions. Be very cautious of food-based aggression, though. So if you notice either dog getting tense or aggressively stealing treats from the other, then end this game. Consider working with a professional trainer on how to train two dogs at once without developing treat aggression. Finish your short training sessions with a big burst of excitement and playtime with both dogs. Run around the yard together in a game of chase, romp, and roll! If your house is a boxing ring, give each dog their separate corner. Crate them in separate rooms (or close the door to the room where puppy is crated) when they are not being supervised 100%. This is absolutely the simplest but most effective thing you can do when you are getting a puppy with an older dog already in the house. Put away all toys in the house for a few days to prevent a common aggression called resource guarding. Offer each dog a bone/chewable treat, but be sure to separate them to opposite sides of the room and remove whichever dog finishes first to avoid a fight. 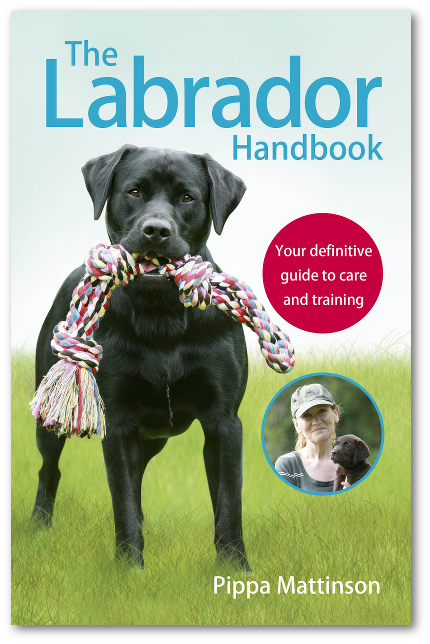 Take both leashed dogs to unfamiliar territory for walks, such as a park or busy public place. The scents of other dogs will become the focus of their attention, and they will suddenly be allies against the world! Ok, so you’ve followed the tips above for bringing a new puppy home with another dog waiting patiently back home. You’ve done neutral introductions and taken both dogs for walks together. You’ve played with them equally and tried some training games to show the dogs that they are a team. But you’re still having problems. Here are some additional troubleshooting ideas if your new puppy and older dog are still not getting along. 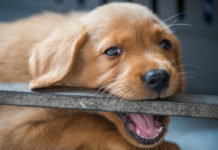 Biting and chewing on each other’s face is part and parcel for puppy play and getting to know other dogs. To a certain extent, I’m comfortable letting a puppy be a puppy for a few moments, nipping and snapping gently at the older dog to initiate play. Since this is exactly how a mother dog would teach her puppies bite inhibition, I tend to let dogs speak their own language to one another to sort out mild differences. If, however, the older dog becomes VERY aggressive and looks like he could really harm the pup, then by all means, intervene with loud clapping or calling one of the dogs over to you out of harm’s way, and crate him for a period of cooling down. Even if the older dog isn’t aggressive with the pup, but the pup is relentless in his play biting, separate the dogs. Don’t give the older dog a chance to hit his threshold of patience. 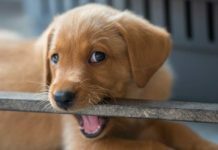 Give your puppy a chew toy that he can take his obsessive chewing behavior out on instead of your senior pooch’s ears. Sounds like you need to be a bit of a watch guard for your new pup. When the dogs are loose around each other, keep an eye on their body language. The minute you see what makes your older dog aggressive to Puppy, step in. When the older dog shows signs of arousal or tension, like if you catch your dog growling at Puppy, break things up with either a cheerful voice distracting them or a deep tone of voice calling, “HEY,” to disarm your older dog. Be sure that both dogs have a space of their own to retreat to. 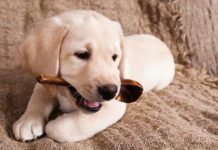 Your puppy needs a place to calm down when he gets overly aroused and gets too energetic or aggressive with you or your other dog. Your older dog needs a space of his own to have quiet, peace, and no nipping puppies chewing on his face. It’s hard not to be anthropomorphic about our pets. Scientifically speaking though, we can’t impart our human emotions and ideas onto our pets. But if your older dog constantly steals toys away from your new puppy, growls if the puppy approaches when you are giving affection to the older dog, or gets more protective over his toys or your attention in general, it could seem that he is jealous of the new pooch in town. Do your best to spend quality time with both dogs. Don’t abandon your one-on-one walks with your older dog. Try some training tricks for how to get an older dog to like a puppy – by rewarding your older dog any time he approaches the new puppy. Give him a treat and praise if the puppy comes near without any incident. If your older dog seems to have less energy, be less playful, spend more time away from you and in the other rooms of the house, or hide in corners or under furniture, he may be more than just a little jealous. He might be full-on depressed at the changes in the household routine. Dogs really benefit from routine and structure, so the sooner you can get the whole household back into a routine that resembles what your older dog was habituated to, the better his mental state will be. We really hope that these tips can help ease your anxiety about introducing a new puppy to your older dog. Don’t be afraid to ask your friends and family for help throughout the process. A second pair of hands and eyes can be very important during critical moments of the introduction. Keep in mind that it will be stressful, because everything about your home life and daily routine, as well as that of your other furry family members, is being disrupted. But it will only be temporary! And you’ll have lots of puppy kisses and furry snuggles to make the time pass quickly! The Other End of the Leash: Why We Do What We Do Around Dogs McConnell, Patricia. Ballantine Books, 2003. Increasing Affiliative Behavior Between Zoo Animals and Zoo Visitors. John Charles Coe. AZA Convention Proceedings, 1999. Effect of affiliative and agonistic relationships on leadership behaviour in free-ranging dogs. R Bonanni, S Cafazzo, P Valsecchi, E Natoli. Animal Behaviour, 2010. Previous articleCan Dogs Sense Pregnancy and Other Medical Marvels? My gsd is 11yrs old, he has been fantastic with a whole range of family/babies and children and pets that have lived with us all, puppies birds,cats kittens un neutered male dog female dogs…we have introduced him to our new member of our house,she is a female 8 week old Doberman pup, Kane instantly took a very bad liking to her and has attacked her more than twice..badly..and for no reason apart from her puppies ways she is extremely obedient for her age and knows not to push playing too much,he seems to corner her and attack within split second when out of eye sight with me, like if we walk into house from garden he will turn on her or when following me in,or when she walks past him…I’m getting him vet checked but lost all trust when he then growled right up to my child’s face which has never happened before and after mailing the puppies three times now causing injury…Please what help or guidness is there to offer as I have tried a lot so far with bad results.i really home someone can help as I love my dogs they are my best friends. Is six years old to old to bread a lab?